The OBS501 is a submersible turbidity probe with active antifouling capabilities for better measurements in biologically active water with both high and low turbidity. It outputs an SDI-12, digitally processed signal that many of our data loggers can measure. The OBS501 is similar to the OBS500, but the OBS501 has better mechanical performance in heavy sediment/sand conditions. 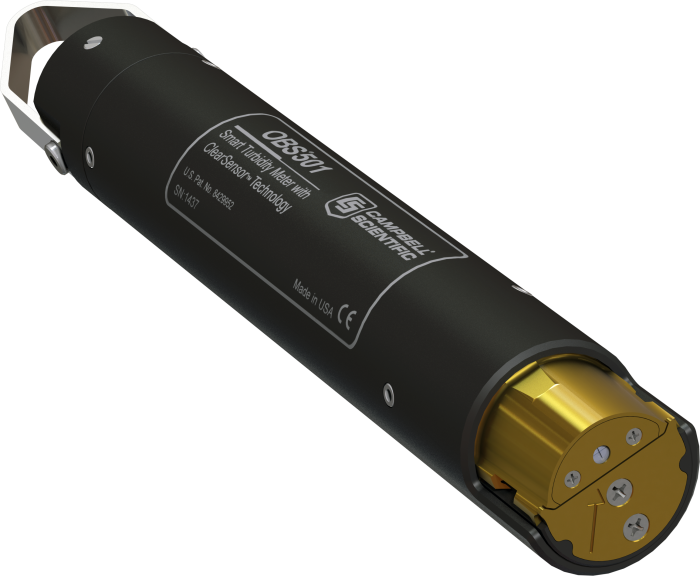 Design features of the OBS501 include the combination of a backscatter sensor (better at measuring higher turbidity) with a second sidescatter sensor (better at measuring lower turbidity). It has a shutter that is opened only during measurements, which reduces the time that algae or other organisms can cling to its optics. The OBS501 is constructed to prevent sand grains or packed sediment from getting wedged between the shutter and sensor body, which inhibits the shutter’s movement. To do this, the OBS501's shutter and body were designed to eliminate parallel surfaces between moving parts wherever possible. The probe also uses a flushing action that moves the sediment down and out of the cavity behind the shutter. To prevent biofouling and ensure better measurements, the OBS501 incorporates the ClearSensor Method (U.S. Patent No. 8,429,952. This method uses a shutter/wiper mechanism to protect and clean the optics. With the ClearSensor method, a chamber is also filled with a biocide that continuously leaches out over the optics while the probe shutter is in the closed position. ClearSensor® and OBS® are registered trademarks of Campbell Scientific. The OBS501 can sense if the shutter’s motor is working harder than normal. If it is, the shutter moves slightly back and forth to dislodge sand grains before fully opening or closing.